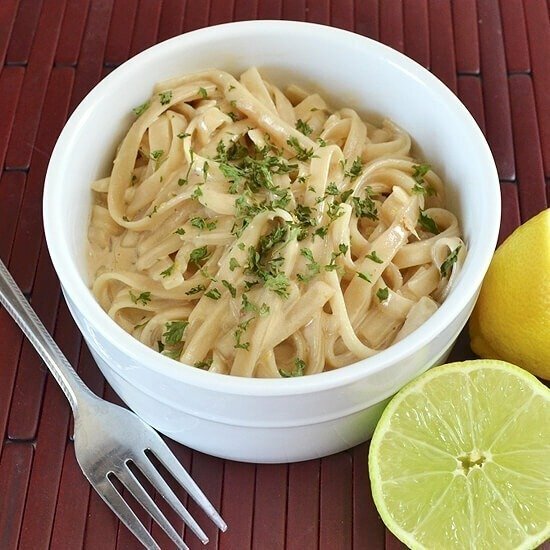 One of my favorite foods in the whole world is pasta with Lemon sauce and I’d get it regularly when visiting one of my favorite Italian restaurants. But one day I realized how silly it was to pay $15 for a plate of the good stuff when noodles were so dang cheap. So I set about creating my own recipe for the zesty sauce to make from home and save super big bucks. I’d been making lemon sauce, or as we call it, limon sauce, for quite some time when I convinced my visiting family to let me make it for supper one night. Because of the citrus they were worried it would be way too tart or tangy or something, so I also heated up a jar of store-bought spaghetti sauce as a backup. Now, my mom is usually not terribly interested in food and I usually will get a response like “it’s okay.” But this lemon sauce recipe, she loved so much that she’s even asked for me to make it again since. In a small sauce pan, bring cream, broth and butter to a boil. Stir regularly to help dissolve the beef broth in the cream. Lower heat to a simmer and allow to reduce by about half, or about 20-30 minutes. Remove from heat and add lemon and lime juice and zest. Take care not to accidentally drop in any seeds. Garnish sauce with parsley and serve. This sauce is naturally kind of thin, so if you like a thicker sauce, add a little cornstarch mixed into some water for the last 5-6 minutes of simmering, stirring constantly. Think you’ll be trying out my most favorite of pasta sauces?